Studenterhytta is a big lodge in Nordmarka, the woods north of Oslo, with a total of 64 beds. ​The facility consists of three buildings and is situated on a hill overlooking Sørkedalen forests. Accommodation and meals at Studenterhytta must be booked in advance. Studenterhytta´s OSI-hytta cabin is available for group rental. The large cabin sleeps up to 56 people. A flat fee is charged for the rental of the entire cabin. A per-bed fee is then added. For individuals, couples and for small groups (up to 8 people), a charming, smaller cabin - "Familiehytta" - is available for rent. Again, a flat fee is required for the rental of the entire cabin plus a per-bed fee. Unfortunately, we do not rent out individual beds or rooms. Studenterhytta appeals to businesses, private parties, students and large groups of people who want to meet in beautiful surroundings for outdoor adventures and recreation. We also offer catering for large events. Superintendents: Marius Bakken and Tone Kristin Bjordam. E-mail: post@studenterhytta.no, phone: (0047) 22 49 90 36, mobile: (0047) 95 07 63 82. Owners: OSI (Oslo Students Idrettsklubb, translates into: Oslo Students Sports club). Marius Bakken and Tone Kristin Bjordam started as managers at Studenterhytta January 1, 2011. They focus on fine cuisine inspired by seasonal ingredients. Studenterhytta has an exhibition space for contemporary art. Guests arrive on foot or on skis in the winter, on foot or by bike in the summer. The cottage is situated in the forest. It is therefore not permissible to drive to the cabin, making it all the nicer to be a hiker. How to get there. Studenterhytta is located at Kjellerberget in Nordmarka. The shortest way to the cabin is from Sørkedalen School, only a 4 km hike on foot or skis. From Frognerseteren via Nordmarks kapellet it is about 6-7 km on skis in the winter or on feet or bike in spring, summer or fall. The cottage is beautifully situated in Nordmarka’s network of trails and ski tracks. Parking. Nearest parking is at Frognerseteren or the large parking lot you come to if you turn right at Sørkedalen School. Public transportation: subway (T-bane) to Frognerseteren, runs several times an hour. Or the subway to Røa, and then bus nr 41, from Røa to Sørkedalen School. Oslo Taxi: (can drive up to the parking lot in Sørkedalen or Frognerseteren). Oslo Taxi Phone Number: 02323. From the air. Aerial view of the cabin from 1954, by Widerøe Airline. It looks pretty much the same today! In the area around Blankvann and Studenterhytta there is a Landscape Protection Area because of many rare flowers and plants. Lodging and facilities. In the OSI-hut there are 56 beds in 4 four-bed rooms and 5 eight-bed rooms on two floors. The standard of the rooms and facilities is quite simple. In this large log cabin, there is also a big living room with a fireplace, a couple of small rooms and a kitchen, showers, a sauna and toilets. The OSI cabin is suitable for large events. Familiehytta. Small cabin with kitchen, living room and 8 beds located in 2 twin rooms and 1 quadruple room (one of the beds is a double bed). There is running water and electricity. Toilet and showers are in OSI hut on the other side of the yard. The cabin is well suited for small groups who want simple lodging with self-catering. The kitchen has a refrigerator and a stove. Restaurant. Kjellerberget Restaurant at Studenterhytta is located on the other side of the yard. It can accommodate up to 60 people and is used for dinner parties (in connection with events), as a meeting room and for party facilities. Meals must be booked in advance. Our location in the middle of the forest in Nordmarka creates the framework for the meals at Kjellerberget Restaurant at Studenterhytta. We collaborate with local farmers and combine it with selected seasonal ingredients. Therefore, we do not have fixed menus, as it gives us the freedom to use the best raw materials available at any time. The menus are adapted to each event, to create the best possible experience for the guests. We take great pride in the meal being a surprising and memorable experience. The manager Marius and the chef Guttorm are brothers. Guttorm has a lot of experience from several well-known restaurants. In Oslo he has for example worked as a chef at Thai restaurant Plah, and as a head chef at Delikatessen at Grünerløkka. Guttorm draws inspiration from several continents and he often combines the exotic with traditional Norwegian food. He uses both modern and traditional cooking techniques and combines these to create interesting taste experiences. We usually serve a three-course dinner with a custom drink menu. It is also possible to order both more and less dishes, ranging from seven dishes to a good stew. For each event we make a daily menu, where all the guests get the same. Of course, we do adapt the food for vegans, vegetarians or allergy sufferers. This must be agreed well in advance. The breakfast consists of bread that we bake ourselves and a rich and varied breakfast buffet. You can also order lunches, snacks, barbecues and catering. We run a family restaurant and many of our employees are our friends and family, something that creates a warm and pleasant atmosphere. History. 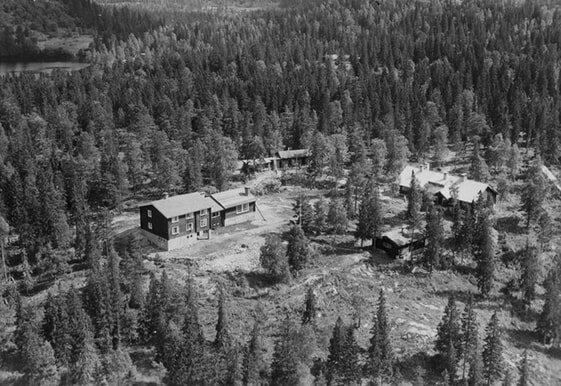 The first Studenterhytta cabin on site was built as early as 1929 for students and partly also by students. The focus was on sports and social activities. Familiehytta, the little cabin, that at that time served as a sauna, was completed in 1946. The building that now houses the restaurant and the café was built immediately after the war. It was completed in 1947. During the construction process the older cabin from 1929 tragically burned down probably because of a broken pipe on a wood-fired stove. The cabin had then been a popular gathering place for many years. Volunteer working morale at the time meant that a new cabin was quickly rebuilt. A large and beautiful new OSI hut was completed in 1949. All the three main buildings were then in place. They have been changed and modernized since then, but the basis for Studenterhytta as it appears today was created in the forties and fifties. 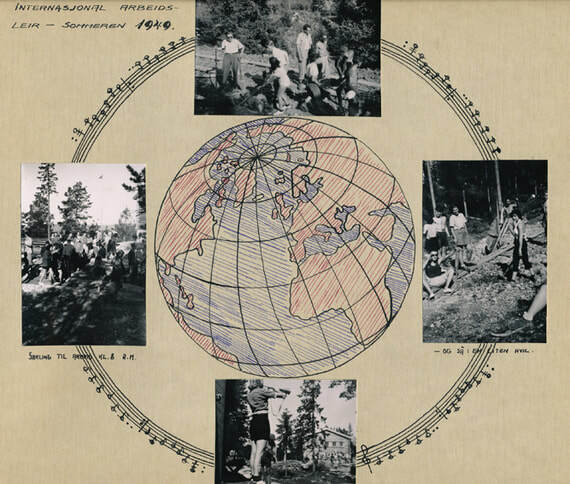 The picture above is from an international student camp at Studenterhytta in 1949. Summertime. In the spring, summer and fall, guests come on foot or by bike on trail or road. Studenterhytta is closed for accomodation in July and opens again in August.